Iron oxides are among the most abundant materials on Earth, and yet there are some of their basic properties which are still not well-established. Here, we present temperature-dependent magnetic, X-ray, and neutron diffraction measurements refuting the current belief that the magnetic ordering temperature of ε-Fe2O3 is ∼500 K, i.e., well below that of other iron oxides such as hematite, magnetite, or maghemite. Upon heating from room temperature, the ε-Fe2O3nanoparticles’ saturation magnetization undergoes a monotonic decrease while the coercivity and remanence sharply drop, virtually vanishing around ∼500 K. However, above that temperature the hysteresis loops present a nonlinear response with finite coercivity, making evident signs of ferrimagnetic order up to temperatures as high as 850 K (TN1). The neutron diffraction study confirms the presence of ferrimagnetic order well above 500 K with Pna'21' magnetic symmetry, but only involving two of the four Fe3+ sublattices which are ordered below TN2 ≈ 480 K, and with a reduced net ferromagnetic component, that vanishes at above 850 K. The results unambiguously show the presence of a high-temperature magnetic phase in ε-Fe2O3 with a critical temperature of TN1 ∼ 850 K. Importantly, this temperature is similar to the Curie point in other iron oxides, indicating comparable magnetic coupling strengths. 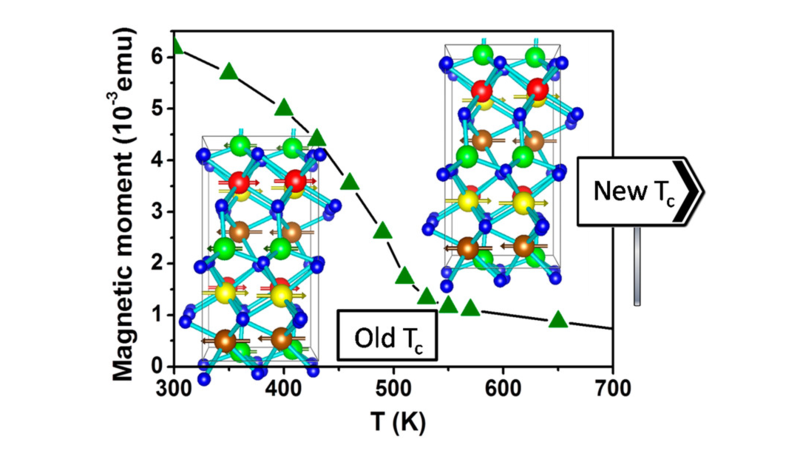 The presence of diverse magnetic phases is further supported by the nonmonotonic evolution of the thermal expansion. The existence of a high-temperature ferrimagnetic phase in ε-Fe2O3 may open the door to further expand the working range of this multifunctional iron oxide.